Hedges around your home can grow at an astounding rate. They seem to grow more quickly when you have the least amount of time to devote to them. Whether it’s the only weekend you have had off from work in months, or if you are retired and attempting to keep manual labour to a minimum, cutting your hedges by hand is no fun. Depending on the amount of hedging around your home, it's advisable to invest in a power hedge trimmer to make this chore less time consuming. The best advantage will be the way your hedges look once you get past the slight learning curve of the handy power tool. Less manual labour means you can devote more of your focus to the way the hedge looks, rather than how sore your hands or shoulders are from using manual tools. In most cases; the longer the trimming blade is, the faster you will be done with your tedious task. Selecting the blade length depends on the size of the bush and the number of hedges on your property. 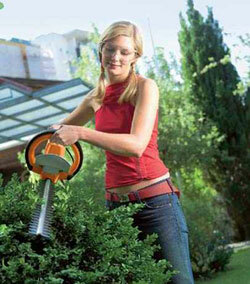 Small hedges only require a blade length of 46cm or less. 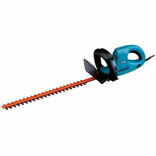 Small to Medium hedges can accommodate blades between 47-56cm. 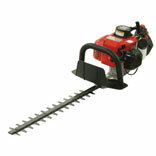 For quick results, a medium to large sized hedges will require a blade of 57cm or longer. These are only guidelines; you may feel more comfortable with one particular blade length. A measure of the blade's width will give you an idea of the maximum diameter range that the trimmer can make a quality cut with. For example: A 20mm wide blade will easily handle a 20mm diameter branch thickness with ease. If you are considering a smaller width to save money; consider the consequences of getting a powered trimmer stuck in a knotty branch and having the trimmer kick back on you. 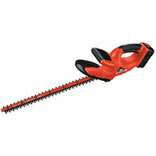 That extra width ensures the hedge trimmer blade is less likely to get stuck in the branch if you hit an obstruction. No doubt some poor bloke had to learn this lesson the hard way. Can be used anywhere an outlet is available. They are a matter of convenience - ideal for small bushes and shrubs. They are not particularly mobile, as an outlet is needed close to your work area. Limited power for larger jobs. There is always a danger of cutting the cord by mistake - the use an RCD power adapter is needed for safety. Increased portability over corded models. The safety level is increased since you don't have to worry about cutting the cord. More manoeuvrable for higher branches as they are lightweight and there is no cumbersome cord to get tangled. More forethought is need as batteries need to charge five to seven hours to get 30 minutes of cutting time. Most models come with one battery but having two batteries is more adequate for medium to large jobs. The batteries or charger can get lost and battery life lessens over the years. Convenient - put petrol in it and get to work. More powerful than corded and rechargeable, so less chance of blade getting stuck. No messing around with batteries or electrical concerns. They are heavier, so they aren't ideal for seniors or those who lack physical strength/endurance. You need a supply of petrol - people living in the city may not have a shed to store fuel. Occasional maintenance is needed to keep motor working smoothly. They produce more pollution, which is a concern for those with asthma or living in urban areas. You might consider getting a collector attachment for the clippings to save time picking up debris when you have finished your trim. Loose clippings will rot and look unattractive. A double position trimmer has a unique adjustable handle with a pivot point built in. This will allow you to bend the trimmer to different angles to get crisp looking cuts on the top, or other hard to reach areas of your hedge. Be sure you have a safety/hand guard on your trimmer. This will prevent dangerous debris from flying out of the trimmer and hitting you or a passerby. Always wear safety goggles and steel capped boots. Never let children or pets in your work area. When using an electrical hedge trimmer always have working RCD protection in place. Never position an electrical cord near the cutting area. Always secure the trimmer with both hands. Never put any part of your body near the blades. The machine must be powered off before removing debris from the trimmer. 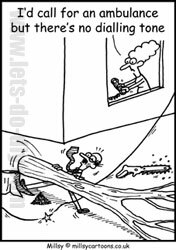 Read, understand and follow the manufacturer's instructions before using your hedge trimmer.